Everytime a key member splits from a band, there is automatically some big pressure on the band to show that they had made the right decision, but it’s even more sensitive when the frontman (woman) and the voice leaves, as the voice is very much the identity of the band and when that changes, so does the whole identity. Just look at Van Halen and Mötley Crüe. But the fact that Nightwish became a bigger band with Anette than with Tarja must have gained some confidence in their members, even though it was kind of surprising. This meant that it was the songs and not the singer that counted, contrary to the old saying “it’s the singer not the song”. But would they manage to make such a change a third time? All of us who have heard Floor sing know without a doubt that she would fit the band vocally, but would Nightwish’s fans welcome a singer change for the third time? First single “Élan” didn’t really convince at first. It has the celtic feel that they let loose on Dark Passion Play and the song itself is a fast ballad, pop song kind of thing. I kept on waiting for the punchline that never came, but after a few spins I realised that the song wasn’t a big chorus, radio friendly pop hit, but more of a grower. A weird choice for a single, but when it sticks it really sticks and I find it awesome now. Opener “Shudder Before The Beautiful” is magnificent, an epic track that is a straight forward hard rocker with a killer Jon Lord organ solo. The song is reminiscent of “Bye Bye Beautiful” of Dark Passion Play. The tune leaves me with a sigh of relief as it proves that Floor is really perfect for the band and also that they haven’t lost any of the quality song writing. “Weak Fantasy” is a bombastic hard rocker that could have been off the Imaginaerum sessions, great stuff and the amazing “Yours Is An Empty Hope” is a typical modern-day Nightwish tune – big, pompous, orchestral and sounds like mini-musical – this is brilliant stuff. With “Our Decades In The Sun” the quality dips somewhat. It’s a beautiful ballad, but it’s also forgettable and passes by kind of unnoticed. “My Walden” is great, though, a killer pop song that reminds me of “Eva” from Dark Passion Play. To me, the title track is a total hit and must be released as a single. This is melodic hard rock at its best, very radio friendly, but still rocks with the best of them. And speaking of hits, they have another one with “Edema Ruh”. The song is nothing special really, just nice pop tune, but dammit, it’s so catchy you just have to surrender. I just can’t stop humming it. And the hits just keeps on coming. “Alpenglow” is another one of those awesome Nightwish melodic rock songs with the melodies to die for. It reminds me of “Amaranth”, one of my favourite Nightwish songs. “The Eyes Of Sharbat Gula” is an instrumental that sounds like a movie soundtrack. It’s ok, but a bit pallid, I think. They end the album with a big rock opera, the 25 minute track “The Greatest Show On Earth” and even though it isn’t the same theme, it feels like a continuation of the 13 minute track “Song Of Myself” from the last album. The song is great, but there’s a spoken word section that ends the song that is way too long and is an overkill by large. The narration is by one Richard Dawkins, Holopainen’s favourite poet. Sure, the band might love it, but my guess is that the stunt is more fun for the band – read Toumas Holopainen – than for the actual fans. Me, I push the skip button as soon as the spoken word starts. I’m sorry, but those things bores the living daylight out of me. That said, this is the heaviest song on the album. 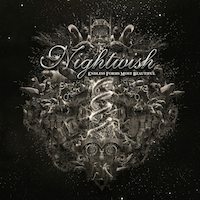 For the Nightwish fans that prefers the Tarja version, this album will probably come as another disappointment, but for us who prefers the Anette version and for those who love both, I have a hard time believing this will disappoint at all. Sure, this album might be a bit harder to digest as it’s not as direct as Dark Passion Play or even the darker Imaginaerum, but once the album has run its claws in you, there’s really no way getting away. Even though the songs might be less commercial than its predecessors, the production isn’t. The album has a very slick production, too slick at times, but it’s still very deep and big and it never becomes sterile or plastic. Also, the mastering makes the album work as well in your phone as in the car stereo – nice to know that there are bands out there that think that the CD format is still relevant. The fact that Floor fits this band perfectly really goes without saying, but ok, she really does. I was never a huge fan of Tarja, I always found here opera soprano style a bit too annoying, but I always like Anette. But, where Anette was a bit too much AOR, Floor really is the best of both worlds. She has the melodic touch and the smoothness in her voice, but she can also go opera on us, but it never gets overmuch, she always makes it comfortable on the ear. In my opinion, Floor is just what Nightwish needs. Hopefully, the lead singer issue is only memory now. I still hold Imaginaerum as my favourite Nightwish album, but this album is too new still to make a fair comparision and when I write the review for the next album, there’s a good chance this album has taken the number one spot since it still grows on me. Nightwish need not to worry, though. They have pretty much nailed it with this album! Am a definite fan of the Tarja era but nah, while she may not have ‘that’ sound Floor brings enough of the original sound while delivering her owns style (and respectfully, in this fans opinion far better than what we got on the last two records) and this record is every bit as good as you say it is. Otherwise agree with your review/rating, this is probably a better album than one might first think, many of the songs creep their way into yer noggin after repeat listens and ya soon realize how good and closer to the original band they sound, Adema Ruh and Alpenglow for example sound like they came off the back of Century Child (my fave ‘Wish) and there’s plenty good here to be had! Damn autospell tune whatever – Yours is an empty HOPE!